Manufacturer of a wide range of products which include fire water pumps, fire pump motors, electric driven pump, horizontal split casing pump, fire centrifugal pump and fire fighting engine driven pump. We are offering Fire Pump Motors to our client. 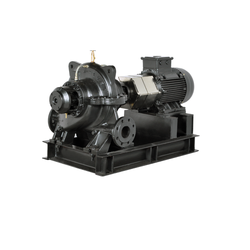 We are leading manufacturer, supplier, and trader in the industry, offering an exceptional range of Electric Driven Pump. 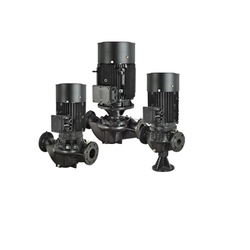 Horizontal split case pumps useful for high flow water pumping. Horizontal split case pumps ideally suitable for industrial community water pumping, lift irrigation, Firefighter and water distribution. The pumps are non-self-priming horizontal split case pumps with radial suction port and a radial discharge port. The double suction design helps pump to balance the forces on the impeller and split case design offer fast maintenance & lower downtime. The pumps have horizontal pump shaft and the volute casing can be dismantled in the horizontal plane along the drive shaft. Irrigation system for fields including sprinkler & drip irrigation system. 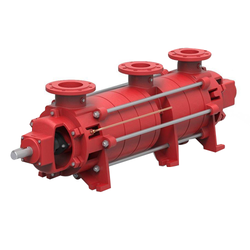 Fire Centrifugal Pump is designed for nonexplosive liquids which are clean and thin without any solid particles. for aggressive liquid please ensure that material of construction is suitable for the liquid to be pumped. If the liquid with a viscosity higher than that of water is to be pumped the power consumption of the pump will increase with an increase in viscosity. This will require a large motor for the pump head discharge and pump efficiency will reduce with increase in viscosity when pumping liquids with a density higher than that of water the power consumption of the pump will increase at a ratio corresponding to increase in density. A firefighting system is probably the most important of the building services, as its aim is to protect human life and property, strictly in that order. Fire Protection Packages for many decades. The most important aspect of Fire Protection package is the reliability of the fire fighting pumping system to ensure adequate water supply at the required pressure at emergency conditions. 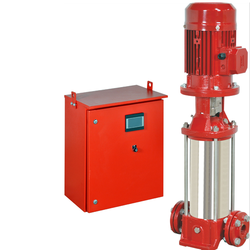 Vertical inline pump sets can be used as Fire Fighting jockey pump is a small pump connected to a fire sprinkler system in order to maintain a certain pressure in the sprinkler system, and sized to ensure that if a fire sprinkler is activated, there will be a system pressure drop and is intended to maintain pressure in a fire protection piping system to an artificially high level so that the operation of a single fire sprinkler will cause a pressure drop which will be sensed by the fire pump automatic controller, causing the fire pump to start. 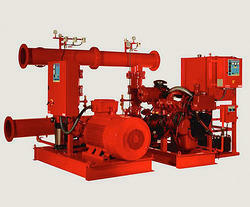 The jockey pump is essentially a portion of the fire pump's control system. A Fire Fightingjockey pump is sized for a flow less than the flow to one sprinkler in order to ensure a system pressure drop. 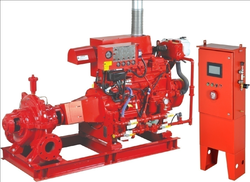 Hence a jockey pump is an important part of the fire pumps control system. Jockey pumps are typically small multistage centrifugal pumps and do not have to be listed or certified for fire system application. The pump is suitable for being directly mounted into the piping, being supported by an integral compact mounting foot, without the need of a foundation. This pump is designed to handle a wide range of process fluids and has one of the broadest hydraulic coverages in the industry. Radially-split, vertical inline centrifugal pump. Single & Double volute casings, depending on size. Single suction, dynamically balanced, closed impeller. Thrust compensation by balance holes & back & front wear ring diameters. Materials of construction per API 610. Heavy duty process design according to API 610 latest edition (OH5 type). Replaceable wear rings for casing and impeller. 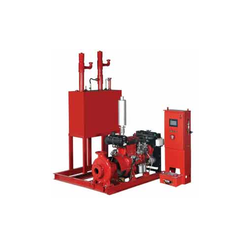 These Diesel Pumpset are typically used in fire-fighting applications for supplying water to fire hose reels, fire hydrants or sprinkler systems. Installations of these pump sets would ensure the safety of human life, buildings, expensive plants, and equipment. LBSD fire pump set shall be used only where a positive suction is provided as specified in NFPA20. Weare offering Horizontal MSMO Pumpset to our client.